As a country, the populous have surrendered to the notion that they have only two real choices on election day: vote for the bleeding hearts on the left who seem to think that our monetary resources are infinite, and who spend this imaginary money on social programs that, for better or worse, make government a bigger part of our lives; or you can vote for the scowling old vultures on the right who were mostly raised in privileged homes, think that governmental aid is for the weak and useless, and who generally make it a top priority to ruin every body’s good time. What’s depressing is the fact that people you talk to everyday, from all walks of life, seem to be dissatisfied with the leaders they put in power, knowing full well that there are a multitude of alternatives. 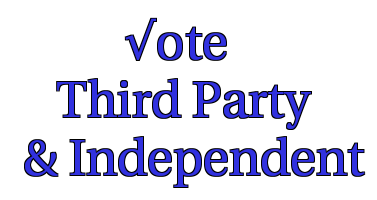 It’s time to give a third party — any third party — a chance to alter the course of our nation. The two-party system in the U.S. is outdated, has outgrown its usefulness to the citizenry and has stagnated and even reversed our progress as a superpower. Why don't these splinter parties come together to form and American Party, consisting of moderate/progressives to take on the RNC and DNC's Right and Left wing agendas. United we stand!